A record-breaking yearling and one of the best bred stallions anywhere! The impeccably bred MR. BESILU sold for an incredible $4.2 million as a Keeneland yearling in 2010 to set the highest price there since 2006 and the highest price ever for a son of the great A.P. 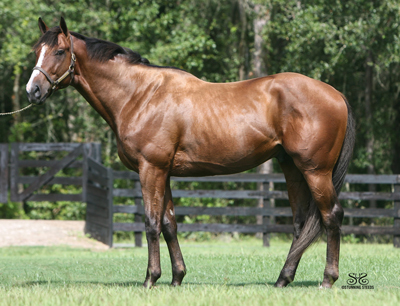 INDY (sire of stallions BERNARDINI, MALIBU MOON, CONGRATS and MINESHAFT). His dam, the three-time Grade 1 winner and millionaire BALANCE, is a half sister to the incomparable Horse of the Year ZENYATTA, a winner of 19 of 20 starts with earnings of more than $7.3 million. His first starter, She B Glamorous, won at first asking in a $34,000 maiden special weight at Canterbury Park!